EAST RUTHERFORD, New Jersey -- A confident Ben McAdoo has taken over as the New York Giants coach, saying the four-time Super Bowl winners need to reload instead of rebuild after missing the playoffs the past four seasons. The 38-year-old McAdoo formally took over the job Friday, less than two weeks after Tom Coughlin stepped down following a 12-year tenure that included two NFL titles. In introducing McAdoo, co-owner and president John Mara said the selection starts a new era for the Giants, one that will be run by the NFL's second youngest head coach. McAdoo says his top priority is to add a fifth Lombardi Trophy to the case. While that may seem far away for a team that has had three straight losing seasons, McAdoo believes this team is closer than many think. "I like the pressure," McAdoo said. "That's what you live for. This is the opportunity of a lifetime. It's the capital of the world, the football capital of world. What could be better? This type of opportunity and this type of pressure, you prepare for it. I have been a guy who has been baptized by fire and I am comfortable with it." The Giants offensive coordinator the past two seasons refused to discuss his staff, saying things were fluid. McAdoo is expected to announce his staff in a couple of weeks, once all the positions are filled. McAdoo used a lot of catch phrases in his introductory speech, noting he planned evolution and not revolution in changing the Giants. One thing that will stay the same is the clocks in the building. They will remain on Coughlin time - running five minutes fast. When he was hired two years ago, McAdoo recalled that Coughlin told him not to mess with the clocks. 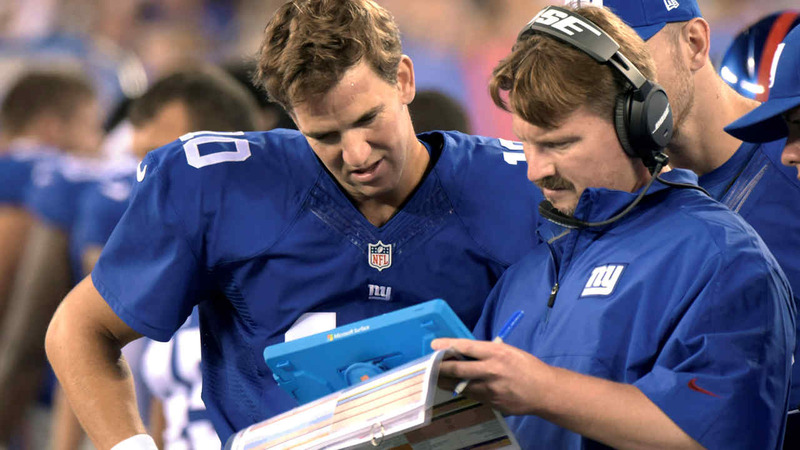 To honor his mentor, McAdoo won't. Other things will change after two straight 6-10 seasons. "The most important thing when you are talking about leadership is you have to be yourself," McAdoo said. "Everybody else is already taken, including Tom. I can't worry about being in Tom's shadow. I have to be comfortable in my own skin." McAdoo has had a meteoric rise in the coaching ranks. He was a high school assistant 14 years ago. He joined the NFL in 2004 as an offensive quality control assistant with the New Orleans Saints, spent a year with the 49ers the following year and then joined the Green Bay Packers for the next eight seasons, working with the tight ends and the final two years as Aaron Rodgers' quarterback coach. He has transformed the Giants offense in two seasons, turning around Eli Manning's career. Manning endorsed McAdoo after the season, but Mara said that was only one factor in the team's decision to hire him after interviewing six men for the job, all of whom Mara said were well qualified to lead the team. Mara said McAdoo's familiarity with the team gave him the edge. He noted that the Giants were aware that the Eagles were interested in hiring McAdoo and it accelerated the Giants' finalizing a deal with him. However, McAdoo would not have gotten the job unless the Giants felt he was the right man, Mara said. "Just something about having watched him on the field with the quarterbacks, with the offense, the first thing that came to my mind two years ago was this guy is a teacher, and he has got an edge to him," Mara said. "He is not afraid to lose his temper. He can bark at guys and I happen to like that." "The quality that impressed me the most this morning was, I think Ben is confident and not arrogant," co-owner Steve Tisch said. "I think his confidence is going to be very, very valuable as he begins to lead this team." McAdoo said there would be four elements to his coaching approach. He will stress strong leadership, talent and integrity, a positive working environment to inspire learning as well asl a comprehensive structure and function, he said. "Football is a people business and it starts with relationships," McAdoo said. "Three values what we will incorporate are respect, humility and dedication. Dedication, obsessed is a word the lazy use to describe the dedicated. We will be dedicated in our football." McAdoo plans to tell general manager Jerry Reese what he needs. The job of getting it will be Reese's responsibility.